After work on Monday, we walked over to the beach at sunset and helped Emma build a little sand castle while the clouds turned pink and deep blue. The temperature was about 70 degrees, there was a warm breeze off the water, and hardly a soul out there except us. So we decided to stay one more night. This place is just too beautiful right now. I want to get out there tonight and see if I can capture some of it with my camera. And Emma wants a beach day today. Here’s a panoramic shot of the St Augustine harbor from Sunday, showing (from left to right): the Santa Maria restaurant; cranes dismantling the old Bridge of Lions; the temporary bridge in the background with steel-framed drawbridge; sections of the old bridge still to be removed, to the right; and a sailboat motoring majestically in to pass under the drawvbridge and head out to the Atlantic. Click for much larger image! “Polished Turd” restoration: These are really common on eBay. Typically the body has been polished, and some easy items like propane tanks may have been upgraded. The hallmark of these trailers is that many cosmetic repairs have been done, such as replacement floor covering (black-and-white vinyl peel-and-stick tiles are popular with eBay sellers). Coca-Cola memorabilia, new curtains, upholstery, and countertops are common upgrades in these trailers — it makes them look good for the photos. But typically floor rot has not been appropriately fixed (many don’t know the right method, which is as bad as not fixing it at all! ), household appliances have been substituted (especially electric refrigerators), non-period accessories and hardware are used, etc. Running gear is sometimes serviced, but not always. Serious structural problems may remain. Polished turds go for big bucks on eBay, usually sold to people who don’t know what holds an Airstream together, or are who are buying their first vintage trailer. I hate to see this happen and I often get emails or calls from the regretful buyers, asking for help. Of course by then, it’s too late. eBay really means it when they say Caveat emptor. “Amateur” restoration: Many people do their own restorations and learn as they go. This doesn’t make them bad but it does make it essential to review the work carefully. Many parts are typically replaced, including appliances, countertops, axles, upholstery, glass, subfloor, floor covering, windows, locks, propane bottles and regulator, brakes, etc. These restorations range from great bargains because the seller essentially is giving away his time and has done a good job — to great disasters, because the seller has done lousy work throughout and fixing everything the right way would cost more than just starting fresh with a new project. If you are considering an amateur-restored trailer, get a second opinion from someone who knows vintage trailers, before you buy! Photos are not enough. “Pro” restoration: A reputable professional shop has thoroughly refurbished the trailer. Typically such a restoration starts around $30k and goes up rapidly from there. If you are considering one of these, talk to the shop that did the work and find out what was done. Reputable Airstream shops are not known by their pretty websites, but rather by their reputation in the community. Everyone knows the name of the owner(s) because the owner is proud of their reputation and is a public figure in the vintage trailer community. Examples include Craig Dorsey, Colin Hyde, Eric Drugge, Dave & Martha Makel, Ron & Linda Amme, and others. If they do good work, you’ll have no trouble finding plenty of people who have used the shop and recommend it. If the shop can’t point to a dozen satisfied past customers who you can readily interview, you have reason to be suspicious. I’ve received plenty of emails about certain hacks out there who claim to be good trailer restorers but have a terrible reputation. All I can say is, ask around before you hire a restorer, or buy a trailer that was “professionally” restored. “Show quality”: Once in a while a restoration goes over-the-top and comes out absolutely spectacular. No detail is overlooked. All components are original or much better than new. The trailer has not even a blemish. Special upgrades are often hidden in the original design, such as wi-fi, satellite TV, hidden A/C, extra refrigerators, etc. Such trailers typically cost in the six figures if professionally restored, and they don’t come up for sale often. I’m putting all this forth in the hope that fewer people will get ripped off buying lousy trailers. If you’ve got a friend who is considering buying something without a proper inspection, tell ‘em to read this blog entry before they blow their cash on what could be a nightmare. It’s Monday for me too. There’s a pile of stuff to be done today, mostly related to the Spring 2007 issue of the magazine. Yes, we are already well into the Spring issue, and a lot more besides. I only mention this because I want you to know that if you are stuck behind a computer today, I can relate. 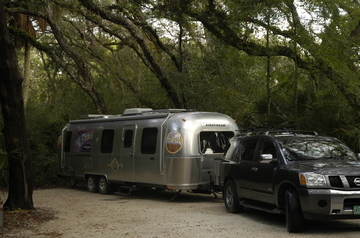 The major difference is that my computer is sitting on my lap in the bedroom of a 2005 Airstream Safari 30, in a park in Florida. That helps me face a long day of administrative work. Yesterday we explored downtown St Augustine. We’ve never walked the residential part of the “Old Spanish Quarter” before, and it was really beautiful. Most tourists never go there, which is a real loss for sure. It has the history and architecture of New Orleans’s French Quarter and Garden District, without the grime, sleaze, and criminality. We broke two guidelines of our trip (diet and budget) by stopping into a French pastry shop on a narrow side street, and having pastry for lunch. But we also abided by another important guideline: be spontaneous and enjoy the little things. It was a good choice. 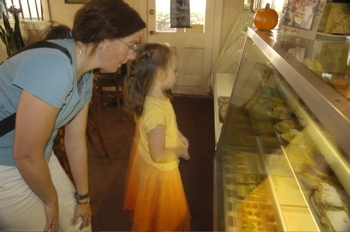 I had a French cheesecake, Emma had an eclair, and Eleanor had a little almond pastry. The Denoel Pastry Shop, recommended! Thus sugared up, we met up with a few nice ghouls and rode the free St Augustine shuttle over to the other side of town, where a kids’ Halloween parade was getting geared up. They marched through St George street (the merchants’ row) and the parade culminated with a costume contest. 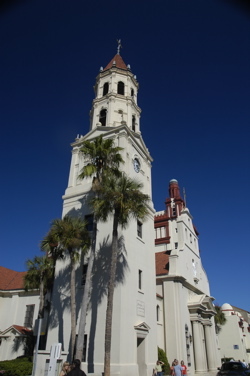 When I get on broadband next, I’ll upload a bunch of other St Augustine photos. It’s a very photogenic city. While we were awaiting the costume judging, I spotted this “sign of the week” on someone’s t-shirt. 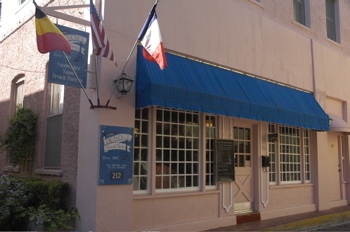 St. Augustine is a fascinating little old city. There are several historic sites worth visiting, an architecturally interesting and diverse downtown, great beaches, a lighthouse, a stone fortification, and much more. The famous “Bridge of Lions” is just one of the many unique things about this town, but it is currently being dismantled and rebuilt. We haven’t walked the town yet on this visit, but we may today. Saturday afternoon we hit the beach. As I expected, it was nearly deserted. 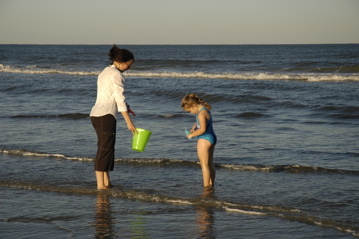 Floridians seem to think that the beach is too cold this time of year. For us northerners, an air temperature of 75 and even higher water temperature is summertime. The beach at St. Augustine is shallow and hard-packed with sand so firm that you can ride a bicycle on it, or drive on it. Driving is not allowed along the state park seashore where we are, but it is a few miles down Rt A1A, and we took the opportunity to go a couple of miles in the Nissan along the one-way (southbound) “road” marked by cones on the beach. In the evening we took Emma to the state park’s Haunted Hayride. This was a real hoot. A local community group staged terrifying little scenes in the forest and got more than a few authentic screams from our wagon of kids and adults. Emma LOVED it. (In fact, Eleanor and I did too.) There’s nothing spookier than a dark forest with mangrove and oak draped with Spanish moss … a perfect setting for a creepies to come out waving machetes. Happy Halloween. Ahhhh…. Florida warmth. We zipped down I-95 yesterday and made superb time, arriving in St. Augustine early enough to buy a few necessary supplies at Camping World before arriving at the state park. Florida greeted us the best way possible: with a warm front. In South Carolina and even half of Georgia, it was running about 66 degrees outside. But the frontal boundary was draped along Florida’s border, so as soon as we arrived the temperature became a balmy 80 degrees and the skies were clear blue. As Emma first stepped out of the car she inhaled deeply and said, “It smells like Florida!” And it felt like summer all over again. Off with the blue jeans and on with the shorts! Tuck the shoes into the cubby and break out the sandals! Hide that fleece! We’re in Florida now! Let the weekend commence! But first that stop at Camping World. Maybe you’re wondering what we bought. I bought a new sewer hose with a new fitting. The old one was beginning to leak a tiny bit at the fitting and my philosophy of sewer hoses is that you don’t mess around with marginal ones. Not worth it. I also bought another roll-up white water hose, 50 feet in length, because we’ve been courtesy parking so much lately. We’ve found that 35 feet of hose is not nearly enough to reach most people’s hose outlets. We also got a new in-line water filter for the hose, since we accidentally left the last one in Jackson Center last August at the Terra Port. And, we shopped for a new shower head but didn’t find what we wanted. Our current shower head is plugging up due to hard water deposits in the jets and we have not been able to get it cleaned out despite several attempts. Anastasia State Park is a really nice spot right along St Augustine Beach. The sand is white and the beach is broad and beautiful. (We were last here with our Argosy in March 2005.) 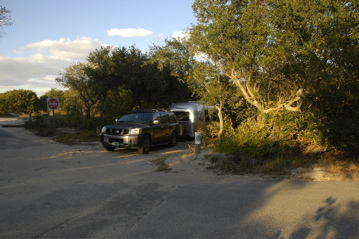 The campsites are nicely secluded in among oak, palmetto, and mangrove, and very shady. No solar power here, but every state park in Florida has water and 30-amp electric at a minimum. We were warned that the park was likely to be full this weekend. After all, this is peak camping season in Florida. But still we didn’t bother calling ahead for a reservation. There are multiple commercial campgrounds along Rt A1A that would have been suitable, and we’re happy to wing it. Sure enough, when we pulled in there was a prominent sign saying “CAMPGROUND IS FULL”. We’ve learned not to take those signs entirely seriously. A big smile for the park ranger will often open up a site that was “taken”. This time, there had been a cancellation only a few minutes before we arrived, so we got that. Our record in this regard is just about perfect — I can’t recall a time we’ve been turned away from a full campground. As we were leaving Virginia Beach I was tempted once again by a local “RV/Truck Wash” place, and once again I regretted even trying it. Towing in urban areas and down Interstate highways eventually results in a brownish oily film on the Airstream which will not rinse off in the rain. When it gets to the point that we don’t even want to touch the trailer, it’s time for a wash. But not just any wash. 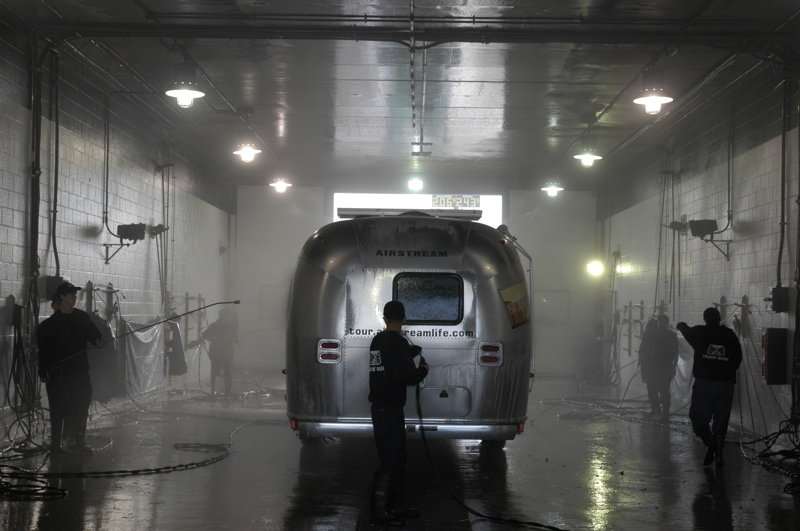 There are only two good ways I’ve found to get an Airstream clean: (1) Hand wash with sponges (we use a microfiber towel to wipe it down after the sponge); (2) Take it to a Blue Beacon truck wash. The local do-it-yourself washes have never worked for us, and we’ve tried many of them. If you use the brushes they supply, you will put small scratches in the clearcoat that look horrible in the sunshine. (Don’t ask me how I know that, it’s too painful. But I can tell you that wax minimizes the damage.) If you don’t use the brushes, the trailer comes out approximately as dirty as it went in no matter how many times you hit it with the high-pressure soap wand. The other thing that annoys me about the do-it-yourself washes is that they never seem to have the proper clearance in the parking area for a big trailer like ours. So the end result of about 30 minutes and $15 in quarters at the RV/Truck wash yesterday was a dirty trailer and a few gray hairs from trying to shoehorn the trailer into the “truck” bay and then get it out again. Very disappointing. Never again. Blue Beacon is $36 for the truck and trailer, but it’s the only wash we’ll use in the future, unless we do it ourselves. They are easy to access, they use only the wands when I ask them (not brushes), the staff have always been immensely polite, and they tolerate me standing around taking pictures and asking dumb questions. I guess they use a better grease-cutting soap than the local car washes because the trailer always comes out beautifully shiny. Yesterday we managed to avoid the dozens of exhortations by “Pedro” to visit South of the Border, and scuttled right down to Florence, SC, where we are overnighting at the Cracker Barrel. The Blue Beacon was about the pinnacle of excitement all day, but we did manage to meet some other Airstreamers in the parking lot of the Food Lion grocery in Emporia VA in the morning. They’d come over from Washington state a month ago in their 2005 Airstream International CCD Bambi 19. We gave each other quick tours of our trailers before heading down I-95. It’s always fun to randomly meet people with whom we have things in common. Tim Shephard of The Vintage Airstream Podcast: Well, you have blown all hope that you were my *level headed* AS buddy. J. Rick Cipot, contributor to Airstream Life: That is awsome! What a fantastic find. Do you get to keep all the clutter too? It looks like everything is there. This is museum quality stuff. I hate you! Dicky Riegel, group VP of Thor: Cool trailer, and I always love seeing the California trailers with the vertical front and rear. So different from my trailer, yet still the same lineage. Fred Coldwell, vintage Airstream historian: …check closely around both wheel wells even if you have to move a bunch of junk to see back there …. and check the frame outriggers at each end of each wheel well for rust and some disintegration. Good luck! You get the idea. Everyone has a different perspective on it, but in the end we are all Airstream nuts. Parts trailer: Less than 30% of the trailer remains in restorable condition. A few random parts are usable. Body is heavily damaged. Appliances, furniture, running gear and accessories mostly damaged beyond economic repair or missing. OR, body severely damaged (as in an accident) and only interior parts remain. Shell: Like the parts trailer, the parts are gone. But the body is very good. Use it as the basis for a custom trailer project (as in Project Vintage Lightning). Plan on expending serious money, since you’re building a new trailer with this type of project. Refurbishment trailer: Body is lightly to moderately damaged, but 30-70% of the major components need replacement. Floor rot is present. This is the most common vintage project trailer I see, ideal for the “makeover” type of refurbishment, where the interior modified with modern parts and/or new floorplan. Restoration trailer: Light damage is acceptable to all components, but less than 30% is destroyed, missing, heavily modified, or in need of replacement. There may be limited floor rot but leaks have not severely damaged the furniture. These trailers are fairly rare, especially in the 1950s and early 60s, since few have managed to last through the decades without major accidents or leaks. These are great candidates to be brought back to original condition. Survivor: The rarest type of trailer. These need less than 20% of their parts refurbished. Few owner modifications have been done. Nearly all of the components are in good condition and need only light clean-up or maintenance. These are excellent candidates for museum pieces, but usually only can be found when the trailer has been stored out of the weather for many years, or in a dry climate. The 1953 Flying Cloud I bought falls somewhere in the upper end of the “restoration trailer” category. It’s about 90% original but one piece of furniture is missing and it has known floor rot. All of the appliances are there but all need clean-up and maintenance. The body has several owner modifications which need to be un-done, and there are several body panels which require replacement. The classification system above refers only to trailers in “as found” condition. Trailers that have been “restored” by a modern owner need their own classification system, because there are a wide range of restorations going on. I’ll talk about those tomorrow. Today we are heading out to I-95 for what may be a dull day of driving. But we’re in search of warmer weather, and no doubt some small adventures will come our way today! We’ve made a change in plans. 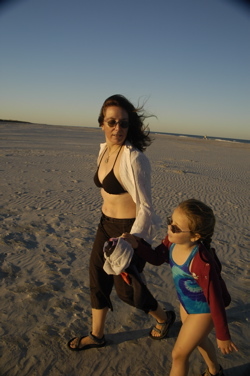 While it’s very pretty here in the state park, and the beach is nice, we are well past the beach season. So instead of taking the coastal route down the Outer Banks of North Carolina, and slowly exploring the seaside, we are going to head for Florida. Rushing ahead to Florida means a couple of days in the car, which we wanted to avoid. But the cold, windy, and occasionally rainy weather we are expecting in the next few days makes even the prospect of a couple of days on I-95 somewhat appealing. We’ll have a longer stay in Florida than we had planned, instead. Our scammer has written back to Ayres. He didn’t comment on the check having a bad routing number, but he promised to send another check in the next week. It’s obvious now that as long as he thinks he can steal $1800 from a dumb American, he’s going to keep pursuing this scam. Any gullible person who falls into the clutches of one of these people will be robbed, without the slightest remorse.